This is a standard DIY kit for building a Microcontroller based project at home, suitable for designing (Basic to Advanced level) project application for workshops, tutorial, student clubs and entrepreneurs aiming at designing new Prototype circuits. In fact the best in class for entry level circuit development design and deployment. A must have product for delivering workshops and trainings on basic electronics circuit design. 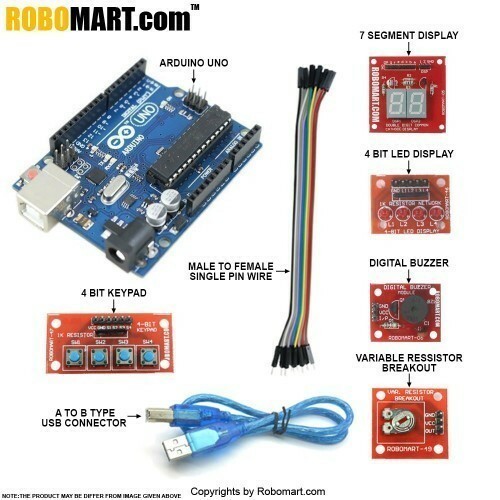 Features of Arduino Workshop Kit Using Original Arduino Uno WithAtmega 328 For All Workshop Companies/College Clubs/Entrepreneurs. Requires basic programming skills and pin connection awareness. Includes everything for developing standard circuits. Best for delivering workshops and training on Microcontroller based circuit design. Kit Contents of Arduino Workshop Kit Using Original Arduino Uno WithAtmega 328 For All Workshop Companies/College Clubs/Entrepreneurs. Male to Female single pin wire. 4-bit LED display Breakout Board. Digital Piezo Buzzer Breakout Board. USB-A to USB-B type connector. Also Searched as :Microcontroller kit india, Buy Arduino Uno original kit india,Arduino Uno kits for school.